Senior Vice President, Field Operations and Global Reinsurance Officer, American International Group Inc., New York, N.Y.
Jessica C. Isaacs is senior vice president and global reinsurance officer in the Personal Lines division of American International Group Inc., the world?s leading global insurance and financial services organization. AIG has operations in 130 countries and jurisdictions. Isaacs? division generates more than $2.5 billion annually. She is responsible for Personal Lines businesses in South America and Europe, and for all Personal Lines reinsurance treaty placements in the 57 countries where her division operates. She travels often to Britain and South America to meet with members of her team, as well as with brokers and reinsurance syndicates at Lloyd?s of London. Isaacs is also active in AIG?s Corporate Responsibility and Diversity Initiative. Beyond AIG, Isaacs is a mentor to young people. ?Over the years, I have had the pleasure of watching people I mentored progress and make successes of their lives. This is a very rewarding experience,? she says. Her service is a testimony to her commitment to youth. She is a member of The Executive Leadership Council and serves on its board of directors, as well as on the board of the Next Generation Network, The Council?s affiliate for young excecutives. 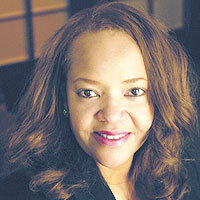 She also is a former board member of The Washington Regional Program against Teenage Drinking and Substance Abuse. Of her husband, parents and bosses she says: ?They have, each in their own way, given me unfiltered feedback and advice, which has helped me along the way. They are my reality check.? Her participation in such initiatives as the emergency task force that President H.W. Bush organized immediately after Hurricane Andrew struck in Florida help to define her accomplishments, she says. In keeping with her mantra, ?you get what you give,? Isaacs dreams of fighting social injustice by donating her time and money to help disadvantaged people obtain an education and the development skills needed to enable them to have a better quality of life and fight injustice. Isaacs attended Spelman College, graduated from Georgia State University, where she recieved a B.A. in political science and sociology and studied at John Marshall Law School in Georgia.